Experience a multitude of activities (white water rafting, micro light flights above the Falls, fishing, canoeing, walking and driving safaris just to name a few) with the beauty and relaxation of being in the natural surroundings of the bush or on your own private island, eating magnificent food and taking in the view. 5 nights in Norman Carr Safaris camps in the South Luangwa enjoying game drives, night drives and walking safaris, explore one of the world’s last great wildernesses. 2 nights at romantic Tongabezi or Sindabezi Lodge in Livingstone – the home of the Victoria Falls and adrenalin activities like bungee jumping and white water rafting. 3 nights at Chongwe River Camp or Kasaka River Lodge in the Lower Zambezi Valley, canoeing, cruising and fishing on the mighty Zambezi River. On arrival in Zambia you will be met at Lusaka Airport and will connect to your flight to Mfuwe. This flight will take an hour and will transport you into the country’s best game viewing area. 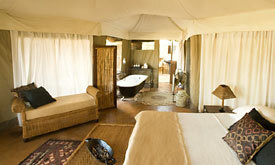 You will be met at Mfuwe by our staff and driven to the first camp where you will have time to settle in before brunch. 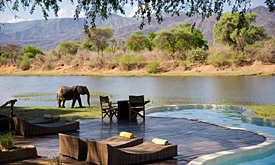 That evening your guide will introduce you to one of Africa’s finest National Parks, renowned for its variety of wildlife the Luangwa never fails to impress. After dark you will search for predators on the prowl and the myriad of smaller nocturnal animals that make these night drives so interesting. Dinner is served in different locations each night. You will have the choice of eating with other camp guests or in secluded privacy perhaps on the verandah of your room or on the deck overlooking the lagoon. Your flight from Mfuwe is via Lusaka and will drop you at Royal Airstrip and then onto Chongwe River Camp, idyllically set on the confluence of the Chongwe and Zambezi Rivers. The spacious, open-fronted suites offer private views across the Zambezi; this is a most romantic destination with the steep escarpment behind you and the Zambezi in front. 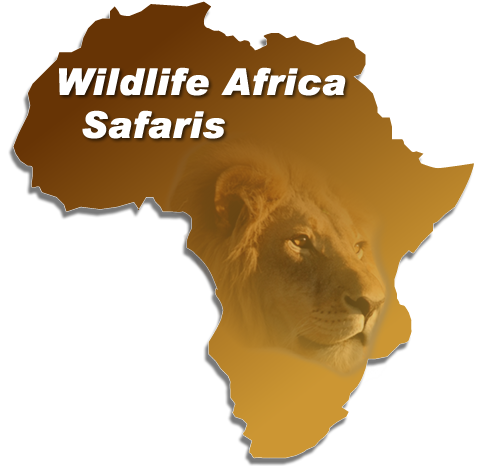 Activities are varied; you may choose a sunset boating jaunt, drifting downstream watching buffalo and elephant playing in the waters as the sun turns them pink, a drive or a walk or for the more adventurous, a paddle in canoes along one of the many channels frequented by hippo and elephant. 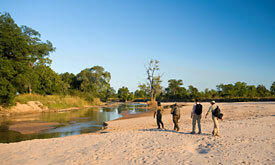 The flight from Royal transits Lusaka again on its way to Livingstone where you are met and driven to Tongabezi Camp. If you are staying at Sindabezi Island, you will be boated into camp. These camps have been described as some of the most romantic in Africa; you are raised above the river and whether in bed, in the bath or just lounging around the room your views of the Zambezi are breathtaking. 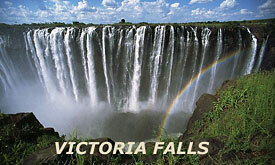 Two nights spent in the Livingstone area will give you a great opportunity to experience all there is to do; an up-close view of the Falls is a must, perhaps take a “Flight of the Angels” which will take you by microlight or helicopter high above the ground. 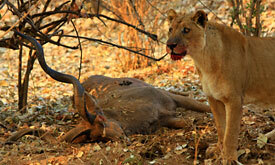 There are also a host of adrenalin activities on offer but do save time to enjoy the tranquility around camp.